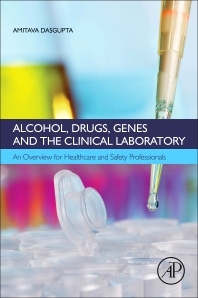 Alcohol, Drugs, Genes and the Clinical Laboratory provides an overview and quick reference to genetic relationships and clinical laboratory information related to the serious public health issue of alcohol and drug abuse. Written in a clear and concise manner, this book discusses the necessary information for health and safety professionals working in public health to learn about complex issues quickly to better help their patients, employees, and others affected by alcohol and drug abuse. Alcohol, Drugs, Genes and the Clinical Laboratory covers the important aspects of drugs and alcohol abuse including genetic aspects along with laboratory methods for analysis of alcohol and abused drugs with emphasis on false positive test results. The book is helpful to healthcare professionals, such as pathologists who oversee alcohol and drug testing, emergency room physicians, family practice physicians who are first healthcare professionals who identify patients susceptible to drug and alcohol abuse, and psychiatrists involved with drug and alcohol rehabilitation programs. It will also be useful to safety professionals who have to assess individuals for workplace responsibilities, ranging from police and recruitment to occupational safety and occupational medicine and public health officials. Can alcohol be produced endogenously?